In a rare pre-WWDC sit-down interview with The Verge, Phil Schiller, Apple’s senior vice president of worldwide marketing, said that Apple would soon alter its revenue-sharing model for apps. 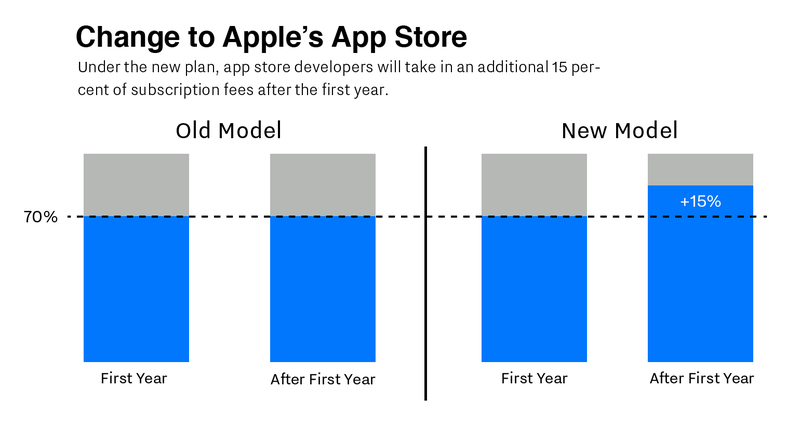 While the well-known 70 / 30 split will remain, developers who are able to maintain a subscription with a customer longer than a year will see Apple’s cut drop down to 15 percent. The option to sell subscriptions will also be available to all developers instead of just a few kinds of apps. "Now we’re going to open up to all categories," Schiller says, "and that includes games, which is a huge category." This entry was posted in Computer, Murmuring, Network, Software and tagged app, apple, interview, mobile, pricing, store, subscription, wwdc on June 9, 2016 by Gea-Suan Lin.